Volunteers are an integral and valuable component of the hospital's staff, and often are a source of comfort and cheer to those who are hospitalized. Volunteers are also needed to offer a warm greeting and assistance to discharged patients leaving the hospital. Information sessions for adults 18 and over are held on the first Wednesday of every month from September through June at 10am in Gillies Conference Room 1 on the first floor. There are no sessions in July or August. Questions? Call the Volunteer Office at (631) 351-2257. Click here to download our adult volunteer packet. High school students aged 14-18 may pick up applications in the Huntington Hospital Volunteer Office. Learn more about volunteer opportunities around the health system. Our team at Huntington Hospital invites you to join our Patient and Family Partnership Council. This is a dedicated group of patients, caregivers and healthcare professionals who partner to create meaningful changes within our hospital. We value your experiences, insights and ideas to help develop our hospital’s services. For more information, please call our director of Patient Experience at (631) 351-7909. You can help Huntington Hospital continue to provide exceptional care for our community. Every gift makes a difference. Organ donation isn’t an easy thing to think about, but it’s really important. Thousands of Americans die each year because there are not enough suitable donors. Being an organ or tissue donor is a generous, rewarding decision that can save so many lives. More than 120,000 people nationwide are on the national waiting list for a lifesaving organ transplant, including approximately 10,000 New Yorkers. Every 10 minutes, another person is added to the list. A single donor can save the lives of eight people through organ donation and improve the lives of up to 50 others with tissue donation. Organ donation—The donation of an organ from an individual who has been declared brain dead. The organs are transplanted into individuals based on need through a national waiting list. Tissue donation—The donation of tissue (bone, eyes, fascia, heart valves and vessels) from an individual who has suffered cardiac or brain death. Living donation—The donation of organs from a living donor to an individual with a matching blood and/or tissue type. Consent for donation—An approval from the family of an organ or tissue donor to donate tissue and/or organs. Even if a patient has signed a donor card, the family still needs to consent. 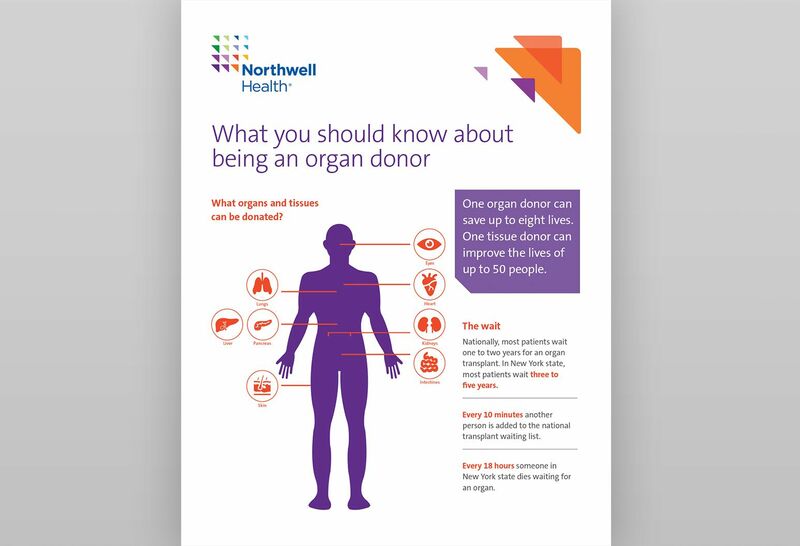 We dispel the myths and answer some frequently asked questions about organ donation. We are a member of the Health Resource and Service Administration’s (HRSA) Organ Donation Breakthrough Collaborative. Through our Service Improvement Coordinating Group for Donation, representatives from all Northwell Health hospitals meet bimonthly to share best practices in organ and tissue donation. Huntington Hospital healthcare professionals have formed a Donor Council, a hospital-based group that is committed to donation initiatives. We provide ongoing education for physicians, nurses, ancillary hospital staff and the community about tissue and organ donation.